The United States Postal Service is alerting all registered voters to watch their mailboxes this week for mail-in ballots for the 2016 General Election. This week, election officials began the process of depositing some of the more than three million ballots destined for Colorado registered voters. "The Postal Service is proud to be a part of the vote-by-mail process in Colorado," said acting USPS Colorado/Wyoming District Manager Rick Pivovar. "Having worked closely with state election officials throughout the last year, the Postal Service is fully prepared to deliver ballots in a timely manner." According to state law, a Postmark doesn't count. 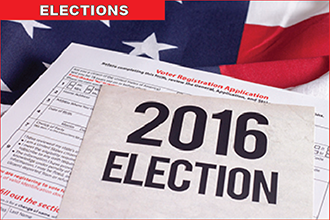 The ballot must be received by the County Clerk on or before 7 p.m. on Nov. 8 to be counted. USPS and the office of the Secretary of State both encourage completed ballots to be mailed not later than Nov. 1 to allow for processing and tabulation. All mail-in ballots require postage, and in some instances, extra postage because of the ballot's weight. "The U.S. Mail serves as a secure, efficient and effective means for Colorado residents to participate in the electoral process, said Pivovar. "For the past several years, voters have entrusted their ballots to the mail and our employees are ready to deliver another successful election season." Additional information can be found at usps.com/electionmail.